Shepherd Hill, and it's powerful offensive line, hosts our Game of the Week against St. John's Friday night. This week’s Suite Sports Game of the Week is a heavyweight matchup between two Central Mass powerhouses. The St. Johns Pioneers (1-0) will head to Shepherd Hill (0-1) and attempt to pick up huge back-to-back wins to open the season, after defeating Catholic Memorial last week. Shepherd Hill, despite being the host, may have to work uphill a bit. The team faces controversy as former Holy Name star running-back Kevin Mensah is being barred from the field by MIAA rules. In order to show support for Mensah, Shepherd Hill head coach Chris Lindstrom sat out the Rams' season-opening loss to Shrewsbury. Expect to see the same thing again this week. Ed. Note- Since the publishing of this story, coach Lindstrom has announced he WILL coach, and that both schools are making progress on getting Mensah back on the field. St. John's is also dealing with a distraction off the field, as at least one player was involved in a racially-charged group chat that occurred after Doherty junior Mike Oppong took a knee during the national anthem Friday night. Despite the potential for both teams to be short-handed, neither one of them has an apparent weakness. These Goliaths are going to grind it out for all four quarters. There is however, one match up that should be particularly exciting. The Shepherd Hill offense has had a bit of a makeover, allowing for a diverse array of plays to be dialed up in an effort to get passed a stacked St. John’s defense. Specifically, watch for the ground attack of Rams going toe-to-toe with the Pioneer’s front seven. The trenches will be populated by two massive, mobile offensive and defensive lines. Should running backs Zack Madgis or Brendan McKeon make it past the Red Wall, it will be up to linebacker duo of John Fields and Liam Doran to stop them from busting into the secondary. In a match up that promises to be tight across the board, look for the difference makers to be the signal callers for both offenses. Quarterback Steve Bucciaglia is the first-year starter for the Pioneers, and he seems poised to step up as a leader for this young but talented offense. For the Rams, Ryan Wong-Li is entering his second year under center. Now a veteran, he is in position to take command of the attack for Shepherd Hill. Football is an 11-man game, so neither of these guys is going to win or lose it for their team. However, should the teams match as evenly as they seem on paper, the winner of this match up might be the team that has more success through the air. 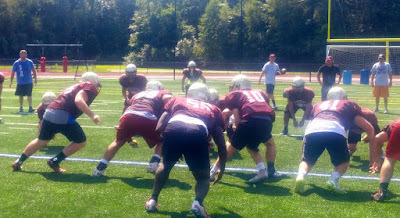 On the St. John’s side of the ball, look for an up-tempo offense to keep Shepherd Hill on its heels and guessing. Combine this with the zone-read run by the three headed running back monster of Peter Oliver, Michael Bernard, and Danny Byers, and you’re looking at a rapid fire attack that will take some serious focus to get under control. We are looking at a game with the potential to be one of the hotter contests of the year. That being said, this week’s pick is going to St. John’s. This team is a perennial state title contender, and though their opponent is loaded with talent, Coach Lindstrom sitting out with major offseason acquisition Kevin Mensah might be enough to tip the scales in the Pioneers' favor. On the flip side, the Rams are coming off a tough loss to Shrewsbury, and definitely have all the off-the-field motivation in the world to come out as hyped up as ever, so expect them to keep it close. "This team is a perennial state title contender, and though their opponent is loaded with talent, Coach Lindstrom sitting out with major offseason acquisition Kevin Mensah might be enough to tip the scales in the Pioneers' favor." Odd choice of words while the senior RB is pleading his case that he decided to go to SH for reasons other than being recruited to play football there.